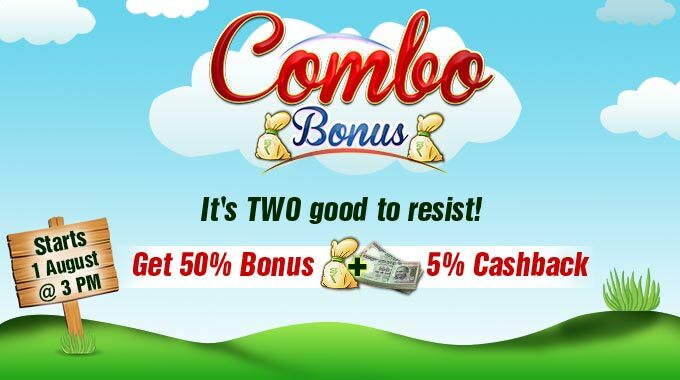 RummyCircle, the premium portal to enjoy both free and cash rummy games online has announced a promotion named Combo Bonus. The promotion is meant to credit your account with a rummy bonus along with cash back on the real money games you lose. If you play rummy to win cash, this will be the best chance for you to boost your account to play unlimited real money games. Login to your account on August 1st 2017 and make the first deposit of the day to redeem this rummy bonus offer. The cashback will be levied on the service tax of the first 30 cash rummy games you play after you make your deposit. So, get in these and grab the Combo Bonus at RummyCircle! How to Claim Combo Rummy Bonus? RummyCircle’s Combo Bonus will run only on August 1st 2017 from 12:30 PM to 02:30 PM. All the cash rummy players are eligible to claim this offer by making their deposit with code AUGCOM17. Once the deposit is made, the players will be rewarded with 50% bonus up to Rs.700 on their deposit amount. The bonus amount will be credited to the player’s account in 20 equal chunks until the complete bonus amount is utilized by playing rummy for cash. In order to get the cashback when you play rummy for cash, you need to join the tables between 3:00 PM and 7:00 PM after making your deposit. The players will get 5% cashback up to Rs.300 on the service charge for the first 30 cash rummy games levied by RummyCircle. The cash rummy bonus offer is applicable only for real money players at RummyCircle. To be counted as a real money player, you need to make at least one deposit and play one cash rummy game. If you have any feedback on the promotions or gameplay at RummyCircle, let us know by subscribing to RummyMania and posting your views in the comment section below.